There is no supra-constitutional centre of power in any democratic system. The pillars of the state derive their powers and roles from the constitution of Pakistan. Perhaps, we need to remind ourselves that this constitution was framed by the supreme will of the people and their representative body, the country’s parliament. The constitution lays down clear-cut powers of the pillars of the state – the executive, the judiciary and the legislative. And any attempts of over-stepping causes problem and creates tensions. To suggest that some people are playing politics over the issue of building a dam in country is an incorrect assertion. The construction of dams is a critical matter of political economy, since it results in the allocation of resources at the cost of several other ongoing and future projects for many years – because the construction of dams costs a huge amount of money. In the past, Pakistan was not able to build a big dam from its own resources, and the World Bank mainly funded dams. We should also note that no other province – other than Sindh – should have a final say in matters such as constructing dam. This is so because Sindh is a lower-riparian area and it suffers most due to water reservoirs and diversions up-stream. Since pre-Partition days, Sindh has been complaining about Punjab’s attempts at water diversion. Rasool Bux Palijo, Sindh’s water warrior, in his book ‘Sindh-Punjab Water Dispute (1859-2003)’ traced the history of the water dispute between upper and lower riparians before and after the creation of Pakistan. Palijo led long protest marches of thousands of people against the man-made water-famine in Sindh. He has also discussed the water conflict in the context of international law that governs the shared waters of rivers and intervention of the British government, basically the idea of ‘not allowing Punjab’ to build dams, canals and barrages’ without prior approval from Sindh. How can Sindh forget the fact that, before dams were constructed, the Kotri-downstream water flow was 125 million acres feet (MAF) of water. It is on record that, before the Tarbela Dam was constructed, the average downstream flow was over 70 MAF, and the delta region was green and flourishing. The construction of large dams is a political question which needs to be decided by the institutional mechanism envisaged in the constitution. This is not in the domain of institutions, other than the one designated by the constitution of the country to handle such matters. Because of the upstream dams and reduced water flows in the delta region, Sindh has already lost 2.3 million acres of land to sea intrusion. The province faces a serious challenge of losing the two coastal districts of Thatta and Badin to sea intrusion. In fact, some estimates fear that by 2030 both districts may not even exist if the destruction of the delta continues at the current pace. Why do people from other provinces assume that the people will be silent on this? When their agricultural lands, cities, villages, graveyards etc will be lost to sea intrusion, will it not be a matter of their very existence? The accord was signed by a dummy Sindh government led by Jam Sadiq Ali, in alliance with the MQM – a government that compromised the interests of Sindh. However, even that water accord is not implemented. 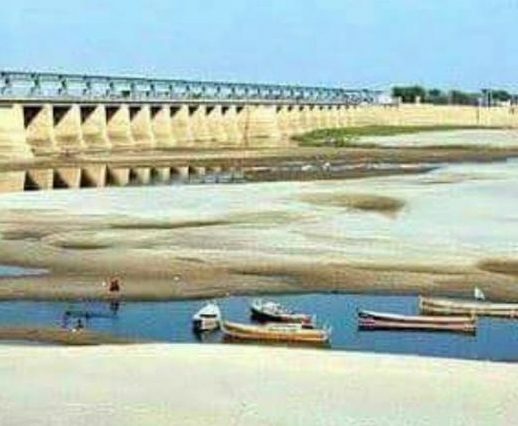 The 1991 Water Accord called for a minimum 10 MAF water discharge downstream the Kotri barrage but that is never done, unless there are floods. General Musharraf, who led a campaign for forcing a consensus (not building a consensus, because three provincial assemblies – of Sindh, Khyber Pakhtunkhwa and Balochistan – had through their resolutions rejected the Kalabagh Dam), ended up failing to convince people in Sindh to agree on the dam. In a meeting with growers and MNAs from Sindh, Musharraf had offered any guarantee to them. One participant to the meeting, late Qamar Zaman Shah, is said to have made this comment: ‘Sindh does not need any guarantee. When there is no guarantee of the constitution of Pakistan in this country, because when a dictator takes over he throws it away and brings in PCO etc, what guarantee are we talking of?’ There were other such sentiments expressed during that meeting as well, some of which General Musharraf is said to have been rather taken aback by. The meeting did reflect how serious the issue of constructing a dam on the Indus is for the people of Sindh. Dams do not create water. They serve as reservoirs of available water. Thus, the fundamental question is the availability of water in the system in any given year. The Indus River Basin gets surplus water only during floods, so basically we are suggesting we build a dam to store flood water. We are suggesting we spend $15 billion to $20 billion dollars on the construction of a dam which will depend on flood water. Based on past experience, Sindh also fears that the dam will be filled every year despite the availability of water, and at the cost of Sindh’s share of national water. For example the Greater Thal Flood Canal, which Sindh unanimously opposed, was constructed by Gen Musharraf, with the idea that it would be opened only during flood season. Has there been a single year when this canal is not opened? The problem with Punjab’s authorities is that they carry out irregular and unapproved water diversion projects, and then build a new case for another project to regularise earlier irregularities. Musharraf lobbied for the Kalabagh Dam, which he did not get approval for. But then he went ahead without the Indus River System Authority’s (IRSA) approval for construction of the Thal canal. This is how Sindh’s water share has been stolen under undemocratic regimes. It is a serious concern for Sindh that some elements are pushing the dam agenda, due to which the province will suffer the most. And anger and a sense of deprivation will take deeper roots.